Hard to believe it’s been so long since I updated you all on this writer’s life. There have been a number of exciting events and developments in the past few months. This past May, I appeared on several panels at my very first WisCon. The convention was a wonderful, welcoming place and I was lucky enough to collaborate with talented fellow panelists as well as meet some great new professional friends. In November, I participated in the Southeast Wisconsin Festival of Books. Good friend and author Andrea Lochen moderated our discussion of Magical Realism and we were graced with a smart, engaged audience. Thank you to the organizers of WisCon as well as the University of Wisconsin-Waukesha for putting together such successful events. More recently, I’ve been sitting on some delightful secret news that I now can trumpet to the world: my short story “Keeper of the Glass” has been adapted by NPR’s storytelling program Snap Judgment and is now on air! The twelve-minute radio play can be streamed from the Snap Judgment website. If you’re a local listener (to me, that is) you can listen to the broadcast this Wednesday, March 16, by tuning in to Detroit’s WDET (101.9 on your radio dial) at 1pm or 10pm EST. I am very excited to be appearing on this program. Snap Judgment is one of my favorite NPR offerings, and I am so happy with adaptation of “Keeper” crafted by producer (and most excellent narrator) Eliza Smith. Go have a listen! I may be a wee bit biased, but in my opinion, it won’t disappoint. It’s been a lot of fun cavorting around the web talking of books and travel and why it’s important to laugh sometimes, even when the world is dark and the skies raining with blood, etc. With several new interviews and guest blogging invitations currently in the works, I suspect you have not heard the last of me for a while. Stay tuned! 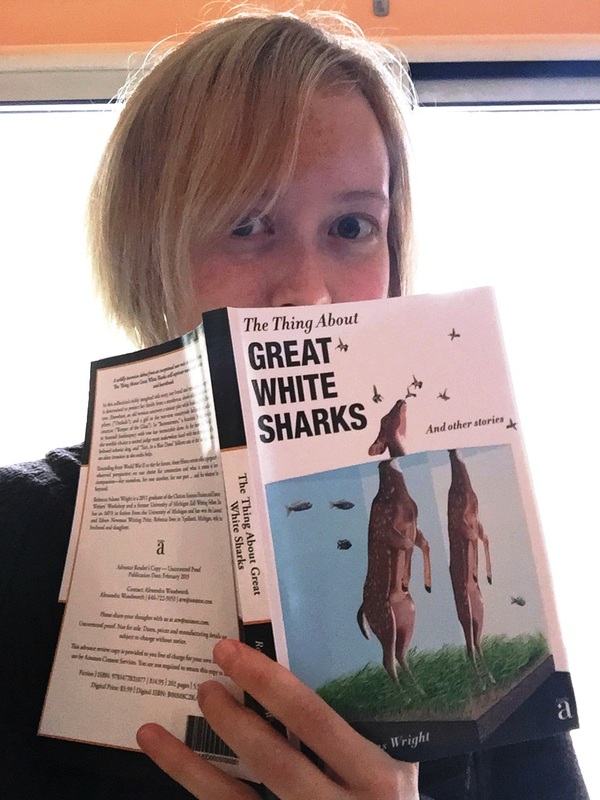 I’m am so pleased (and relieved) to be able to say that the launch day for The Thing About Great White Sharks was an enormous success. On the local front, the book launch party went off without a hitch. We had a great turnout, food was eaten, wine was drunk, a story (“Orchids”) was read, and merriment was made. Kodi Scheer provided a wonderful introduction to the evening and my father, bless his heart, showed up with a poster blow-up of my very first book review. Which takes us to launch day success story #2: The Thing About Great White Sharks received a starred review in Publisher’s Weekly! To say I am excited about this is an understatement. I am absolutely thrilled that PW enjoyed the diversity of the collection and considers me a “promising writer stretching her talents in every imaginable direction.” If you would like to read all of the kind things said about myself and my stories (and who am I to stop you?) the full review of Sharks can be found on the Publisher’s Weekly website. 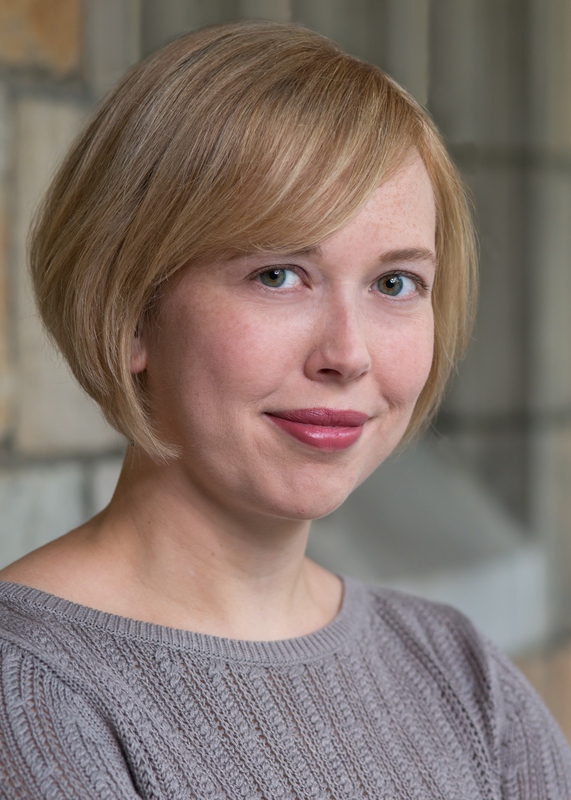 Two: I was Monday’s Guest Blogger on the SF Signal, talking about dark subjects, humorous writing, and how (and why) they should come together. Whew! A lot of appearances, a lot of excitement, a lot of words. The important thing behind all of it is that The Thing About Great White Sharks is out in the world. That means that it belongs to you, friends. I hope you enjoy! It’s been awhile since I’ve appeared with book news, but that doesn’t mean the wheels of publishing haven’t been turning. First paperback copies of the book will soon be on their way to my place, and, in the meantime, I have scheduled that most important celebration: the book launch party! Anyone local to Ann Arbor or Ypsilanti, Michigan should come by the Ypsilanti-based Ladies Literary Club on February 10, 2015. A certain debut author will be reading and signing there at 7pm, and I hear rumors that there may be cupcakes.